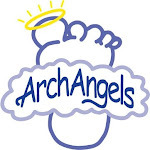 Dr. Manolian, co-founder of Ashton Industries and one of the inventors of our beloved Arch Angels, recently was interviewed for an article about foot health for young marathon runners, in anticipation of the upcoming Boston Marathon in April. Let us know if you want to learn more about any of the topics covered in the article, and I'll get Dr. Manolian to write a guest spot. Springtime in New England almost - although they're threatening snow this weekend, so we're not out of the woods yet. But, of course, my hot-blooded 5-year-old has already donned her new flip-flops outside. What's a mother do to? This is not my favorite time of year, when the shoes become hazardous and do nothing to su...pport tender little arches. I'm on a mission this year to find the best, most supportive sandals for little feet. My first two candidates are KEEN Sunports and Crocs Kids' Althens with the back-strap. I'll keep you posted. Do you have a favorite sandal for little feet?